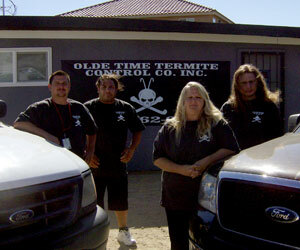 At Olde Time Termite Control Co. Inc., we understand that pests need to be taken care of promptly. Our company also understands that they are a concern to the safety and well being of you and those around you, as well as your property and grounds. It's our goal to help you address these concerns as soon as possible. We have a vested interest in providing an environmentally conscious, cost—effective solution for your pest problems. We specialize in long—lasting termite treatments, using Bora—Care, a borate mineral salt based product. This product has been tested to kill and control wood destroying pests. Why Olde Time Termite Control Co., Inc.? We are family-owned & operated! When you deal with us, you deal with the owners! Our pest control specialists have the training, experience, and resources to assure protection and elimination of all types of destructive pests. Additionally, we're experts at the proper, proven methods of selecting and applying pest—control chemicals. Subterranean termites are extremely destructive and are the most common type of termite found in California. First they build tunnels to wooden structures, and then they burrow into those structures to obtain food. Any wood or cellulose—containing material constitutes termite food, and given time to do so, they’ll eat until nothing is left but a shell. Termites avoid light and air, so they build their colonies where you’re not likely to stumble upon them. Drywood termites are the second most prevalent type of termite in California. They can be very hard to detect and treating this species of pest requires experienced professionals. These termites live deep inside wood, where they spend their entire lives. Because of this, they are even less likely to be seen by people than subterranean termites.